Left: PfRON2 is expressed at the apical end of Plasmodium merozoites. Schizont infected erythrocytes and merozoites were dual-labeled with antisera against PfRON2 and PfAMA1 PF11_0344 (A), PfClag3.1 PFC0110w (B), or PfRON4 PF11_0168 (C). Merged images are shown in the right panels. All segmented schizonts and merozoites are positive for PfRON2. Nuclei are counterstained with DAPI. Colocalization of PfRON2 with PfRON4 (rhoptry neck marker) was observed but neither colocalized with PfClag3.1 (rhoptry body marker) nor PfAMA1 (microneme marker). Right: Longitudinally sectioned merozoites in schizont-infected erythrocytes were labeled with anti-PfRON2 serum followed by secondary Ab conjugated with gold particles. Gold particles were restricted to the narrow neck portion of the rhoptries (R). Two different images are shown (A and B). N indicates nucleus. Bars=200 nm. Cao J, Kaneko O, Thongkukiatkul A, Tachibana M, Otsuki H, Gao Q, Tsuboi T, Torii M. Rhoptry neck protein RON2 forms a complex with microneme protein AMA1 in Plasmodium falciparum merozoites. Parasitol Int. 2009 58:29-35. Spatial localization of PfAARP by co-immunostaining studies with rhoptry resident protein Clag3.1. P. falciparum parasites were coimmuno-stained with anti- PfAARP (green) and anti-Clag3.1 (red) antibodies. The parasite nuclei were stained with DAPI (blue). Clag3.1 staining was present in the rhoptry bulb in the free and invading merozoites (lower panel). PfAARP was localized just above these two rhoptry bulbs towards the apex of the merozoites. Enlarged image of merozoite invading in the host erythrocyte is shown in the insetWickramarachchi T, Devi YS, Mohmmed A, Chauhan VS. 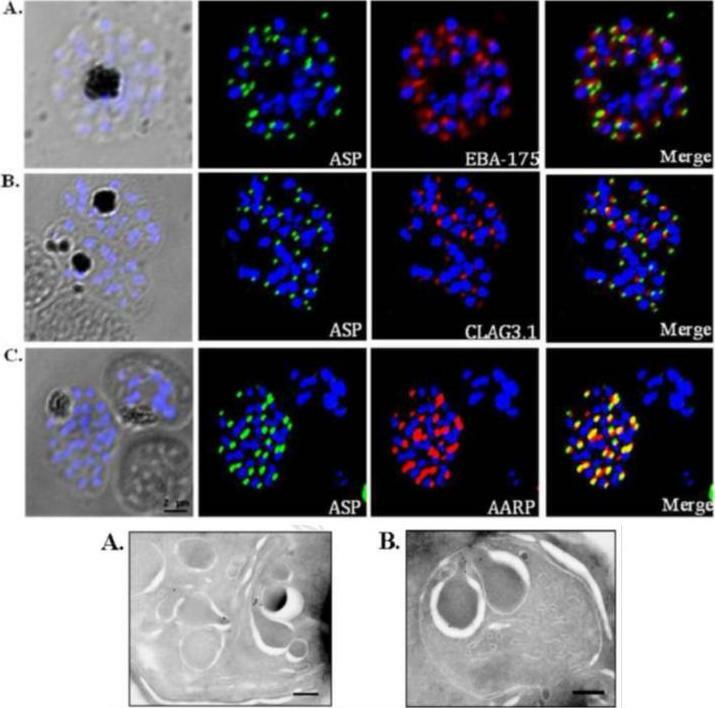 Identification and characterization of a novel Plasmodium falciparum merozoite apical protein involved in erythrocyte binding and invasion. PLoS ONE. 2008 Mar 5;3(3):e1732. Immunofluorescence assay to show localization of PfRhopH3-C in rhoptries. (i) Co-localization of PfRhopH3 and PfClag3.1 using their respective antibodies at schizont (S) and free merozoites (M) stages. Staining with preimmune sera and anti-GST antibodies respectively were used as controls. The parasite nuclei were stained with DAPI (blue). PfRhopH3 and PfClag3.1 were localized at the apical tip.Ranjan R, Chugh M, Kumar S, Singh S, Kanodia S, Hossain MJ, Korde R, Grover A, Dhawan S, Chauhan VS, Reddy VS, Mohmmed A, Malhotra P. Proteome analysis Rrveals a large merozoite surface protein-1 associated complex on the Plasmodium falciparum merozoite surface. J Proteome Res. 2010 10(2):680-91 Copyrihgt American Chemical Society 2011. 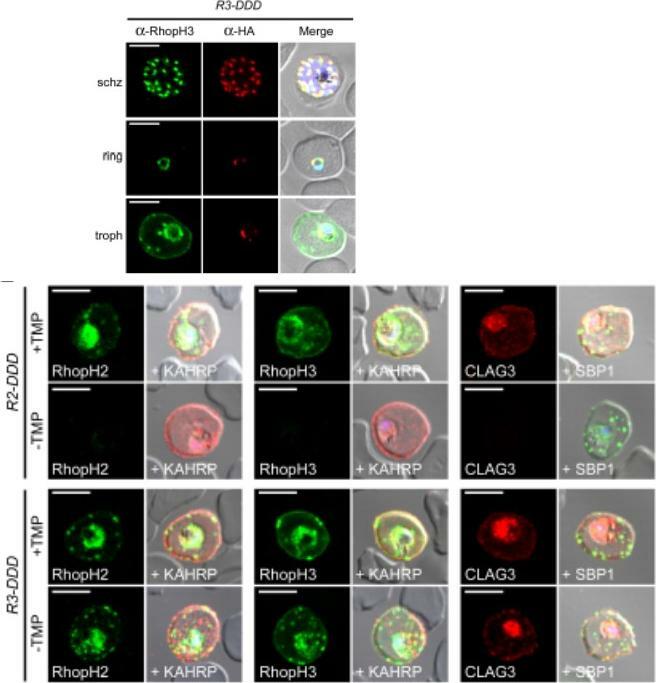 IFA of indicated proteins in R2glmS (RopH2 knockdown) and R3glmS (RopH3 knockdown) at schizont stage; colocalization with RAP1 and apical puncta in daughter merozoites indicates rhoptry trafficking. Scale bars, 5 μm. GlcN treatment of either R2glmS or R3glmS abolished not only the targeted gene product but also CLAG3, a third better-characterized member of the RhopH complex. Indirect immunofluorescence microscopy confirmed this surprising finding and provided additional insights. 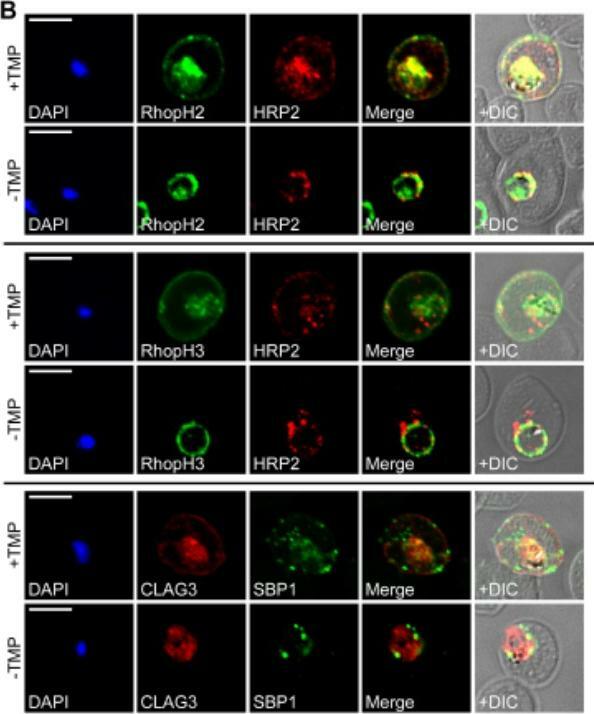 While RhopH2 was still detected in the R3glmS knockdown, it did not fully colocalize with RAP1 but instead had a more diffuse distribution; this suggests RhopH2 may be retained in the parasite endoplasmic reticulum if it fails to interact with RhopH3. 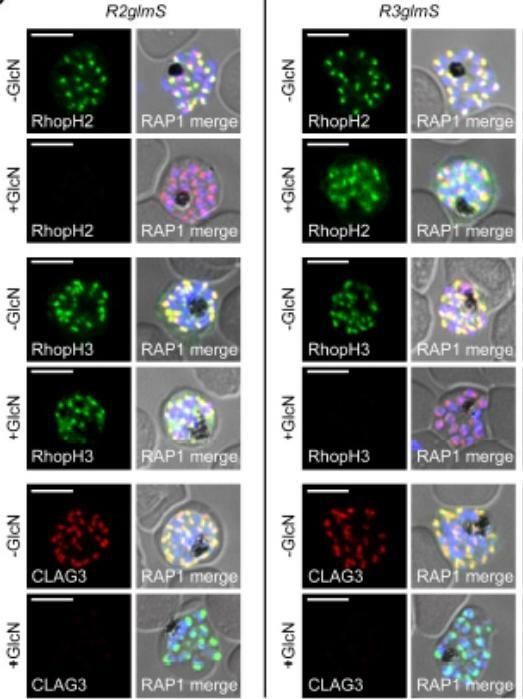 In contrast, RhopH3 appeared to traffic normally inGlcN-treated R2glmS parasites, as indicated by apical colocalization with RAP1 inmerozoites. Thus, CLAG3, RhopH2 and RhopH3 assemble into a complex either during or immediately after translation.Ito D, Schureck MA, Desai SA. An essential dual-function complex mediates erythrocyte invasion and channel-mediated nutrient uptake in malaria parasites. Elife. 2017 Feb 21;6. RhopH2 and RhopH3 are membrane-associated proteins. 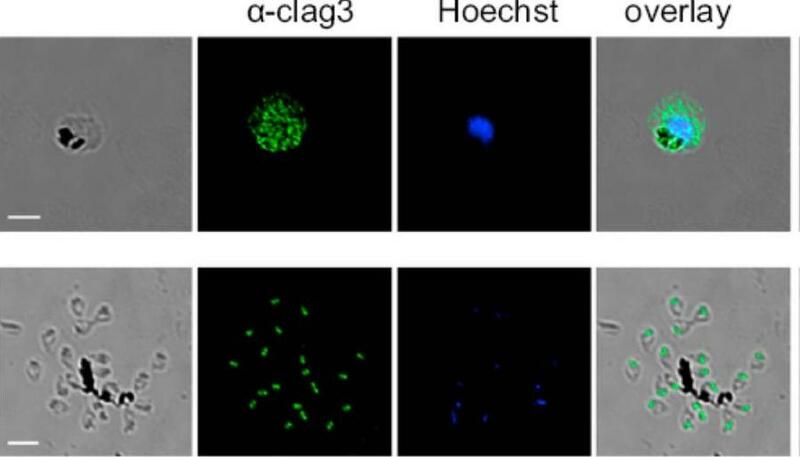 IFA of indicated proteins in R2glmS (RopH2 knockdown) and R3glmS (RopH3 knockdown) at the trophozoite stage. IFA of mature schizont-infected cells with indicated antibodies. 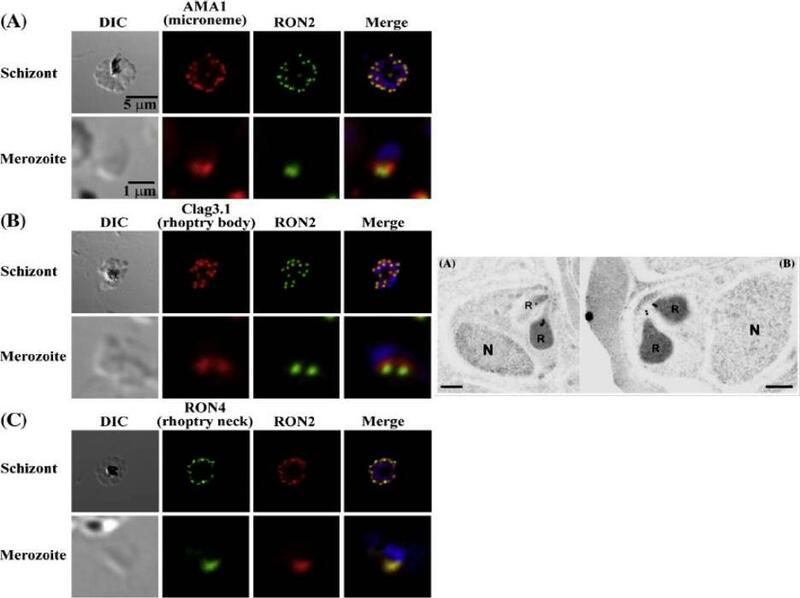 Punctate labeling indicates that these proteins localize to rhoptry organelles in daughter merozoites. Scale bar, Scale bars, 5 μm. IFA of trophozoite-infected cells, showing that each protein localizes to the host membrane and to the vacuole surrounding the intracellular parasite. Scale bar, 5 μmImmunofluorescence microscopy confirmed packaging into rhoptries within schizont-infected cells (B). 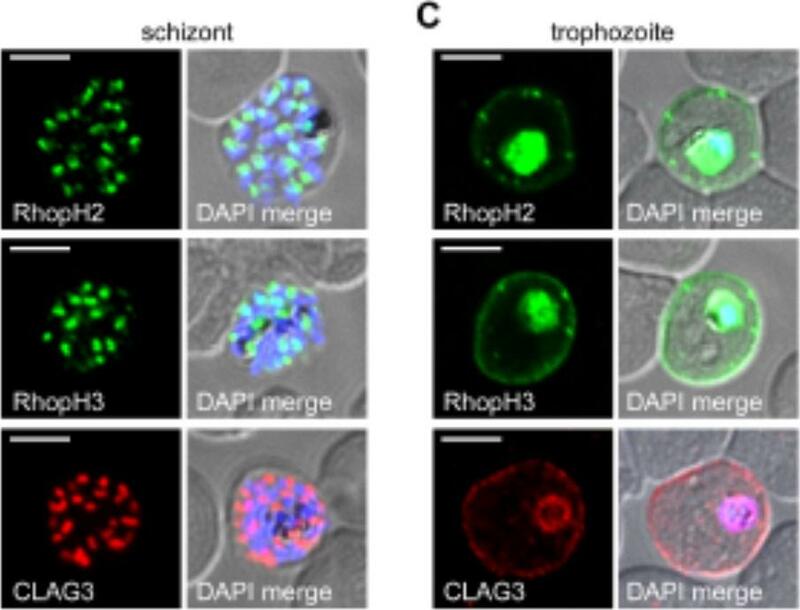 Imaging of maturing trophozoite-stage parasites also showed that these proteins traffic to the host membrane (C). Because each gene is transcribed and translated only within schizonts, the protein found in these maturing trophozoites reflects transfer from the merozoite during invasion.Ito D, Schureck MA, Desai SA. An essential dual-function complex mediates erythrocyte invasion and channel-mediated nutrient uptake in malaria parasites. Elife. 2017 Feb 21;6.